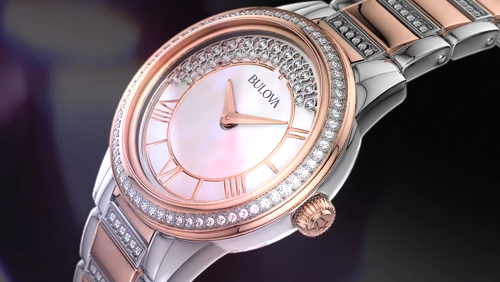 Impossibly stylish, this Bulova Ladies' Crystal TurnStyle Watch is perfect fashion accessory for the style conscious woman. Boasting a sumptuous slim stainless steel tone embellished with 139 Swarovski©Crystals on bracelet, bezel and floating on white mother-of-pearl dial, domed mineral glass, stainless steel bracelet with deployant closure. Water resistance to 30 meters. 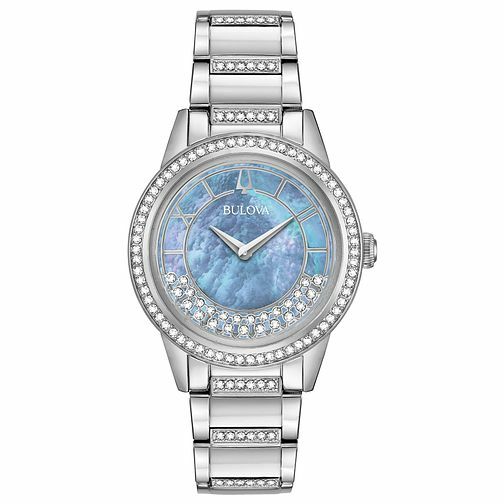 Bulova Ladies' Crystal TurnStyle Bracelet Watch is rated 5.0 out of 5 by 1.